Dial Archive | Dial | Building Community | One Lucky Guitar, Inc. The Biggs family of businesses has a long legacy of amazing residential and development throughout our region. As the company’s operations and services have expanded, we worked with them to create brand consistency, beginning with the overarching Biggs Group. 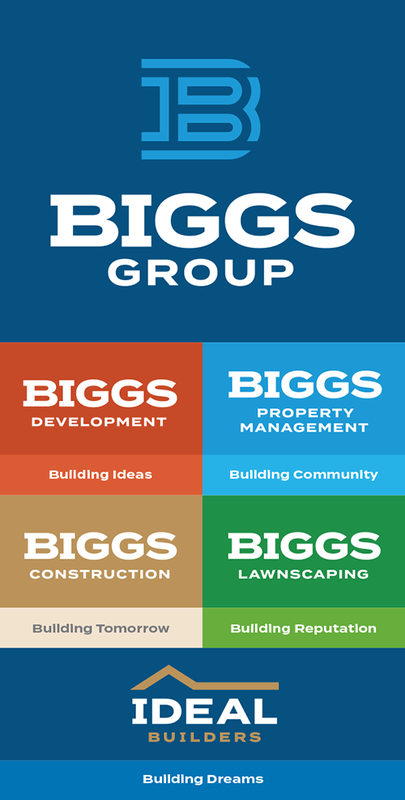 Biggs Group is the umbrella that oversees Biggs Property Management, Biggs Development, Biggs Construction, Ideal Builders and Biggs Lawnscaping. The divisions sought to refine their overall brand, and roll that evolution out to each sub-brand. Starting with brand soul discovery sessions, we learned about this highly motivated, purpose-driven group—one that is deeply committed to making sure their clients are cared for, respected and on the path to success. Frankly, we were inspired. From these sessions, we were able to define brand language as well as a rallying cry for Biggs Group and its entities. As with most major brand discovery sessions, this engagement came with an opportunity to discuss a logo change, and in Biggs’ case, it was appropriate to implement something new that would work well for all entities. Custom typography led the way, with a logo that was crafted for the word “Biggs” to stand strong. A version of the “B” is also used as an icon when needed. To help differentiate each division, colors were chosen for each sub-brand that made sense for the business. We think the new identity works well for all involved, and we’re looking forward to benefitting from all the projects that Biggs Group is involved with in our community’s future!